Biography of American Portrait Artist, History Painter. One of the most important painters in American Colonial art (c.1670-1800), John Singleton Copley is regarded as one of the best portrait artists in Colonial America, and a pioneering figure in American art of the 18th century. In 1774, at the age of 36, he went to London where he enjoyed a second career as a society portrait artist, and also as a history painter - specializing in depicting modern true-life events as moral tales from Ancient History. His best-known paintings include: Colonel Epes Sargent (1760, National Gallery of Art, Washington DC), The Boy With a Squirrel (1765, Museum of Fine Arts Boston), Brook Watson and the Shark (1778, National Gallery of Art, Washington DC), The Death of Chatham (1779, Tate London), The Death of Major Peirson (1783, Tate London), The Repulse of the Floating Batteries at Gibraltar (1791, London Guildhall), and The Three Youngest Daughters of George III (1785, Buckingham Palace London). Despite his great success in both portrait art and narrative history painting, a late melancholic decline left him penniless. He never returned to America. John Singleton Copley was born in Boston, Massachusetts, to Irish parents Richard and Mary Singleton Copley, from County Limerick and County Clare respectively, although his father never lived to see him born. His step-father Peter Pelham, a portrait artist and engraver, may have taught him the art of painting, as by the age of 15 Copley was able to engrave in mezzotint, and by the age of 19 had already established his own practice as a portraitist. By his early 20s he was producing portraits - in both oils and pastels - as good as anyone in America. Amazingly, he was largely self-taught, a facility illustrated by his book of anatomical studies of the human body, written while still a teenager, which is now on show at the British Museum. In 1766, Copley sent one of his paintings for exhibition in London. The work, The Boy with the Squirrel (1765, Museum of Fine Arts Boston), showed his half-brother, Henry Pelham, seated at a table, playing with a pet squirrel. Highly praised by both Joshua Reynolds and Benjamin West, it led to the young Boston artist being elected a Fellow of the Society of Artists of Great Britain. By the age of 30, Copley's portrait paintings had made him rich and famous across Colonial New England. The leading individuals of New England came to his painting-room as sitters. In 1769 he married the beautiful and poised Susanna Farnham Clarke, the daughter of a rich Tory merchant and a New England woman of Mayflower ancestry. The marriage was both happy as well as socially advantageous, and went on to produce six children. Copley continued working, accepting portrait commissions from as far afield as New York. He did not however paint in the South. A number of Southern portraits initially attributed to him were in fact executed by Henry Benbridge. In the early 1770s, a rise in revolutionary activity in Boston (Copley's family was generally Loyalist in sympathies), coupled with a growing sense of isolation from European fine art, led to Copley's departure for London. After a 9-month European tour (which included Paris, Rome, Naples, Florence, Mantua, Venice, Cologne, and the Low Countries), Copley settled in London where he continued to paint portraits, adapting his vigorous New England style to a more ornate, fashionable manner. These works, while on a par with the best works of his contemporaries, are now seen as inferior to his early American portraits. Even so, he remained very much in demand as a portraitist and executed portraits of several members of the royal family as well as a number of British and American celebrities (John Adams, John Quincy Adams). In addition, London gave him the opportunity to explore the medium of history painting - a genre largely ignored in Boston - and he took full advantage. His first major narrative painting was Brook Watson and the Shark (1778, National Gallery of Art, Washington DC), which depicted the rescue of Brook Watson from a shark attack in waters off Havana - whose subjects were, in the manner of his countryman Benjamin West, painted in modern dress. Moreover, contrary to the best traditions of academic art, the subject of the oil painting was selected for its excitement and entertainment value, rather than its ethical or moral significance. Copley's other historical pictures were more conventional, and featured a number of heroic military themes. 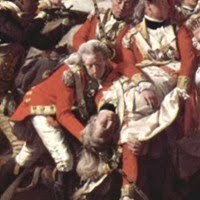 They include: The Death of Chatham (1779, Tate London), The Death of Major Peirson (1783, Tate London), The Repulse of the Floating Batteries at Gibraltar (1791, London Guildhall) - one of the largest oil paintings ever painted in Britain - and others. Like his later fellow Irishman Daniel Maclise RA RHA (1806-70), Copley proved much more adept than his rivals at constructing multi-figure military compositions, and these works gained him considerable acclaim as one of the best history painters in England. Between the years 1776 and 1815 Copley exhibited forty-three works at the London Royal Academy of Art, which elected him an associate member in 1776 and a full member in 1783. Sadly his last decade was marked by depression and financial disappointment. According to some art historians and critics, Copley was the greatest American painter of the 18th century. This reputation is based partly on his outstanding American portraits, and partly on his contemporary history painting, which he fashioned from a combination of news reportage, idealism, and drama. In addition, Copley was a pioneer of the tradition of American realism, adopted during the 19th century by landscape painters like Thomas Cole (1801-48) and Frederic Edwin Church (1826-1900), as well as subject/genre painters such as Winslow Homer (1836-1910), Thomas Eakins (1844-1916) and Edward Hopper (1882-1967). Finally, Copley was one of the first full-time artists to organize private exhibitions of his own work, and to market prints of his paintings to mass audiences - an approach which drew forceful criticism from the London Academy of Art. Paintings by John Singleton Copley can be seen in many of the best art museums in New England and Britain.  For more information about modern American painting, see: Homepage.